Pretty amazing, isn't it? Hard to believe that parents believe that since their children lose their baby teeth, this is the way it happens. This is NOT what children's teeth are supposed to look like. Ever. Yet, this is a typical occurrence across Oklahoma. We see this nearly every single day. I serve as the Executive Director of the Oklahoma Dental Foundation. The ODF is a great non-profit that works to eliminate barriers to oral health care for Oklahomans. Literally traveling the state in mobile dental units, our program, MobileSmiles Oklahoma, is in partnership with Delta Dental of Oklahoma Oral Health Foundation. We try to get to as many communities, schools, churches, other non-profits - sometimes even the middle of a field - to make sure that we are reaching out to people who need oral health care and, for a variety of reasons, can't see a dentist. We try to find a way to get to as many people as we can, offer them care and education, then move on to the next place. We are truly helping people, especially children, who are at the mercy of their parents taking them to a dentist. I use the term mercy carefully. Because what we see is that parents, many who suffer with oral health pain themselves, believe decay and pain are just the way they have to live. So, until we demonstrate to parents and caregivers that mouths should not look like the picture above and that mouths should not hurt, we are reliant on parents to decide that a dental visit is important. We also have programs to help those with mental health and substance abuse problems (but are on their way to recovery) and women who are trying to get their lives back in order after being incarcerated. 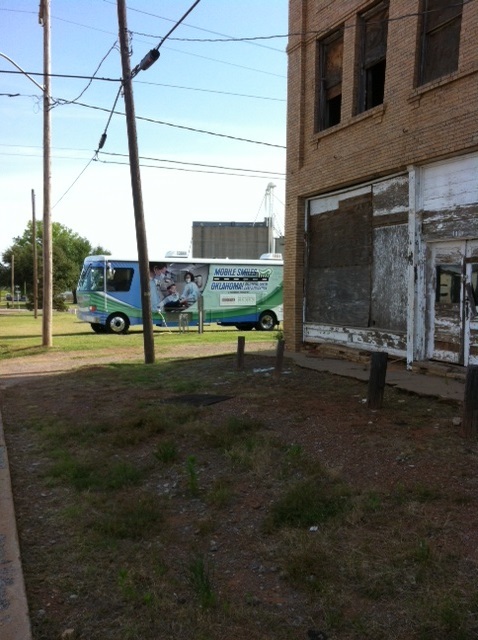 MobileSmiles Oklahoma is trying to get to every part of the state where there are people with oral health needs. And we take care of them at no charge to the patient. Ever. Over the years, I have had the opportunity to work with many non-profits. Some are focused on health issues, some education, others nutrition, still more on safety and raising healthy children. Over all of this time, I've seen something that really gets me thinking. Is the work of non-profits helping the people that we intend to help or is it creating a circumstance where we enable people to continually make poor choices? It is a difficult, but important, question for non-profits and churches. For instance, several years ago, I was the Executive Director of a statewide non-profit called Safe Kids Oklahoma. Safe Kids was the only non-profit in the state which worked to prevent the number one killer of Oklahoma's children - unintentional injury. Safe Kids Oklahoma provided cars seats to those who needed them, bike helmets for kids who went through rider safety programs, smoke detectors for houses with children in them. This idea of enabling bad choices hit hard at Safe Kids. We advertised that we would distribute and install car seats on a first-come-first-served basis. Cars would line up hours in advance. The car seats we distributed cost Safe Kids approximately $59 per seat (at the time) and were provided at no cost to the family. Many times, we were in the parking lot of a WalMart (a store which reportedly sells car seats) for the distribution event. As we got to a car and prepared to properly install a new car seat for the child, we would be forced to move $100 or more worth of beer and cigarettes (just purchased from WalMart - which is also reported to sell car seats for less than $59) out of the way so that the child could be made safe. We just had to get comfortable with the realization that the caregiver was at least willing to give the child a chance at safety by going through the Safe Kids process of installing the seat. But the question is burning to be answered - were we simply encouraging the parent to NOT spend money in keeping their own child safe by giving away the seat? They had enough disposable income for "vices," in fact, far in excess of the cost of keeping their child safe. Yet they chose not to do that and instead use their money to intoxicate themselves. Did we empower a family to be proactively safer for their child or did we enable them to keep making bad decisions (like not having a child safety seat in the first place)? We wrestle with that question for MobileSmiles as well. Many days we pull the MobileSmiles unit up to a school parking lot and treat children who have not seen a dentist and who have a dental need. All that we ask is for the parent to fill out a permission to treat form and our volunteer dentist will help their child. Amazingly, that is often too much to ask. There are days were we have to cancel a visit to a location because not enough parents have returned the permission to treat form. We are told that someone needs to call the family and remind them to fill out the form. In some communities (even in Tulsa and Oklahoma City) the only way to get the forms returned is for someone to literally go door-to-door to get the permission. Permission for a child to receive necessary - and free - care. It seems absurd to me that dentists are ready to provide free care, the MobileSmiles facility is on-site with staff and support ready to treat but someone actually has to go knock on the door of a hurting child to get a caregiver to respond to the offer of help. This raises a question that we have to work our way through. Are we making it so that a parent does not even need to take responsibility for getting needed dental care by pulling into the school to provide that care? They don't have to take off of work. They don't have any cost. Are we empowering the child to be free of dental pain or the parent who wants their child to be cared for or are we enabling the caregiver to ignore the obvious needs of the child and wait until someone shows up at school to "fix" the problem? I believe these are vital questions for non-profits and churches to ask of their programs. Do we really help our clients "be better" or do we create an environment in which they come to realize that someone else will provide the solution to their problem? 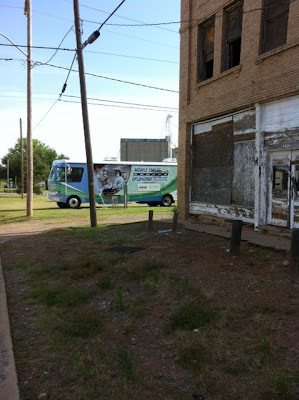 With MobileSmiles Oklahoma, we are helping the children who we see. Because of what we do, fewer children miss school, more children live without pain and they begin to know what oral health means for them. For those other groups that we help - we see that we are making a difference in their lives, too. Women who have been in prison already have many strikes against them in getting a job and keeping out of a situation that would return them to state custody. With proper oral health care: cleanings, extractions, in some cases dentures, we can positively affect them and get them a chance at a better life. For all of those patients who can't get to a dentist on their own - what are we creating? Empowerment or are we creating a situation where people only wait to be treated? It's a non-profit and church dilemma. Let's hope we answer it right.